Development of a Hazard Mitigation Plan provides a significant opportunity to reduce the nation’s disaster losses through mitigation planning. Following a federally declared disaster up to 15% of the amount of the declaration may be made available for jurisdictions having approved mitigation plans. For example, a $10,000,000 federally declared disaster will result in as much as $1,500,000 being made available for performing hazard mitigation projects defined in the jurisdiction’s Hazard Mitigation Plan. After November 1, 2004, only communities, tribes, counties and states with a FEMA-approved mitigation plan will be eligible to receive mitigation funds following a presidentially declared disaster. If you don’t have a plan, you get nothing. By coming together to develop a single Hazard Mitigation Plan cities and counties have a lot to gain. Planning and implementing mitigation measures rely on teamwork that bring together a broad range of officials involved in building codes, development, land-use planning, emergency management, and engineering. The cost of recovery and rebuilding after the destruction caused by a natural disaster is much greater than the cost of planning and preparing before disaster strikes. Flanagan & Associates, LLC uses a 10-step process, based on guidance and requirements of FEMA, to develop hazard mitigation plans. Organize to prepare the plan. Coordinate with other agencies and organizations. 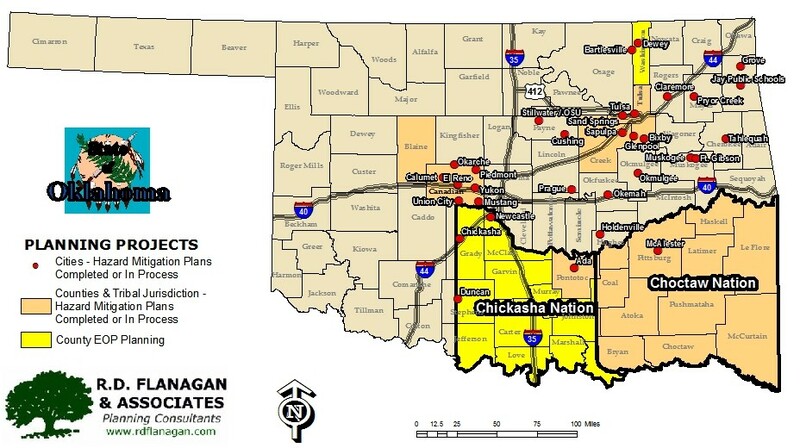 The complete Yukon Multi-Hazard Mitigation Plan is available as an example of a Plan approved by the Oklahoma Department of Emergency Management (ODEM) and Federal Emergency Management Agency (FEMA).